It’s easy to find yourself looking through unorganized, overloaded shelves in the laundry room. Unsightly detergent bottles, dryer sheets, lint rollers, and other accessories can make it tricky to locate what you’re looking for, let alone use anything properly. At Boston Closet Company, we are proud to offer laundry room organizers Boston residents love! Our ideas and designs provide a place for everything you need when washing clothing. Consider a few hacks that work perfectly with our laundry room organizer designs. Our laundry room cabinets offer Boston homeowners plenty of space for everything you need to do the laundry. These are great for storage of items both large and small, so you can keep a tidy laundry room without all the visual clutter. Laundry room cabinet installation is also a great way to accommodate extra bath towels, washcloths and linens. Use cabinet liners or shelf paper inside your cabinets to help protect them from caustic laundry products. This also makes cleaning dust and dirt from your cabinets a quick and easy task. When you are ready to update the look of your laundry room, simply update your cabinet liners to match! 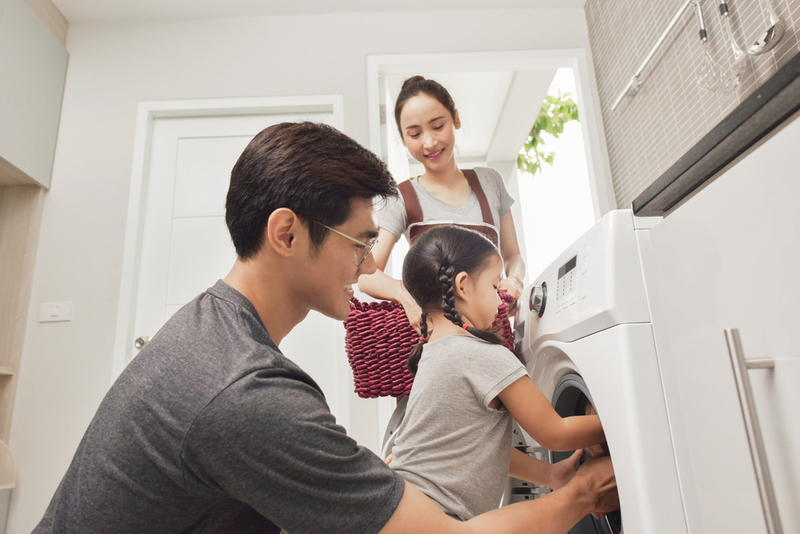 Put detergent, dryer sheets and fabric softener right next to or above the washer and dryer for easy access. These should be in a place that is easy to reach, but inaccessible to pets or small children. Cabinet locks are a great option to deter toddlers who do not yet understand that certain items should be kept out of reach for safety reasons. Use a collection of small trays to keep track of little items. For instance, one small tray may contain pins while another has stain removal sticks. This is also a great way to keep track of extra buttons that might get lost in the wash. Label the trays so you can see exactly where everything is when the drawer is opened. Put a label on the outside of each drawer near its handle. This will help make it even easier to find exactly what you’re looking for without rummaging through drawers and cupboards. Install a tilt-out hamper in your laundry room or bedroom closet to help keep your laundry off the floor. This tip has the added effect of keeping your home clean until laundry day comes. We recommend using one hamper for light items of clothing and another for dark items. If you only have one tilt-out hamper, then you can place two baskets inside it for the same effect. Consequently, this will help sort your laundry before putting anything into the washing machine. Put a removable cotton liner in your tilt-out hamper to help keep it clean. The liner can be removed once a week and may even be put into the washing machine along with your clothing. Label the adjustable shelves in your laundry room to keep all of your cleaning items organized. Designate one shelf for detergent, fabric softener, bleach and fabric softener sheets. Another shelf should be for the clothes iron, spray starch and a spray bottle of water. Items that are used together should be stored together so they are convenient to find. Designating a shelf for specific categories of items makes it easy to know when it’s time to purchase more, too. Use glass or clear plastic containers for various items used in a laundry room such as clothes pins, safety pins and packages of home dry cleaning sheets. These containers organize loose items and give your shelves a neat appearance. Our family-owned company in Boston is proud to provide creative home storage solutions to the residents of New England. We invite you to give us a call at 617-628-1150 or contact us online to arrange for a free in-home design consultation.